Step 1: Clean surface with nzyme solution. Because Enzymes are very specific in their task and one needs the right enzyme to break down the various organic matters, one is guaranteed that the right enzyme is in our formula to break down all the organic matter (biofilm) on the surface. 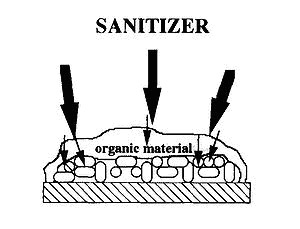 This gives you the customer peace of mind that when one wipes down the surface all the organic matter is removed thereby improving the performance of the sanitizer, as discussed in the first paragraph. Explanation of how Enzymes work. Enzymes are proteins, composed of hundred of amino-acids, which are produced by living organisms. They are responsible for a number of reactions and biological activities in plants, animals, human beings and microorganisms. They are found in the human digestive system to break down carbohydrates (sugars), fats or proteins present in food. The smaller pieces can be absorbed into the blood stream. Below is an Outline from a document called “Sustainability roadmap for Hospitals”. Cleaning with multi-enzymatic instrument chemistries for medical device reprocessing. Use of multi-enzymatic cleaning solutions improve outcome, save money via greater efficacy and shorter cleaning time, eliminate caustic detergent chemicals and neutralizers, and improve the useful life of surgical instrumentation. Medical devices and surgical instruments represent a large portion of a medical facility’s spend. Reprocessing instructions should always be referenced to keep reusable instruments in good working order. Reprocessing of medical devices includes pre-treatment, cleaning, rinsing with high purity water, and drying of devices prior to subsequent sterilization or disinfection. Cleaning is the critical first step when reprocessing surgical devices; thorough cleaning is required before sterilization and high level disinfection can occur. Incorrect reprocessing can result in product failure and even in danger to the health and wellbeing of the patient. Improper cleaning of surgical devices can be a vector for Surgical Site Infections (SSIs) and Hospital Acquired Infections (HAIs). Removal of infectious agents, organic and inorganic soil, is critical for patient and staff safety. Large volumes of cases and pressure to turn around sets quickly have lead to reprocessing concerns, and the need to evaluate cleaners that can provide efficiencies and address needs. Enzymatic cleaners were originally designed as pre-cleaners for use in endo/GI labs to remove soil on endoscopes in patients’ rooms. In the 1990’s enzymatic cleaners were introduced to facilitate the reprocessing of surgical devices, and to provide a more neutral pH cleaning formulation for instrument preservation. Recent studies have shown that enzymatic cleaners may not only remove, but may actually degrade infectious agents. When utilizing enzymatic cleaners, several factors must be taken into account including water temperature and quality, contact time, concentration, and pH. Some enzymes, including proteases, are more active at higher pH, and some are active at neutral levels. Enzymatic detergents consist of a detergent with a neutral pH or low alkaline formulation to which one or more nzymes have been added to surfactants and stabilizing agents. Enzymes are catalysts that speed up chemical reactions up to 1,000,000 times. Even detergents with the same surfactants and ingredients without enzymes take at least 10 to 15 times more contact time to achieve an acceptable outcome. Although most enzymatic detergents are diluted in tap water for cleaning and automated washing, when RO or distilled water is used outcome and reprocessing times are improved. However, it is important to follow manufactures recommendations for dilution rates. Rinsing is important after cleaning with enzymatic cleaners to remove adherent soil and residue as enzymes in cleaning detergents keep working until they are washed away. Enzymatic cleaners also clean waste pipes and washing machines, and contribute to the breakdown of contaminants in the waste water stream, as well as the target soiled devices. Caustic alkaline detergents release hazardous chemicals into the waste water stream, killing native aquatic species and affecting the sustainability of our planet. Traditional caustic alkaline detergents reduce the useful life of medical devices through pitting and corrosion, increasing instrumentation repair and replacement costs. Multi-enzymatic detergents are by nature biodegradable, and some are safe for aquatic life in waste water stream. pH neutral instrument chemistries are non-corrosive to delicate valuable instrumentation, extending the devices’ useful life and reducing repair and replacement costs. pH neutral detergents often follow the enzymatic wash step, and provide chelating action and further removal of residue. pH neutral detergents are highly recommended for the final wash phase when processing eye instrumentation. Chemical analysis using a spectrophotometer measures enzyme activity. Some enzymatic cleaners contain only one enzyme or two enzymes that are the same type, such as two proteases. Multi-enzymatic detergents containing more than one type of enzyme will remove more types of soil like blood, fats, starches, and carbohydrates, than single or dual protease cleaners that only address protein. Multi-enzymatic cleaners come in ready-to-use and super-concentrated varieties that can work for pre-cleaning, soaking, automated washers, manual cleaning, and for one brand in ready-to-use single use wipes for manual cleaning. Liquid multi-enzymatic cleaners can be dosed for concentration unlike solid brick cleaners which melt and cannot be measured. Liquid multi-enzymatic cleaners demonstrate significant savings, providing a better ROI than other cleaning chemistries. Although the document outlines the cleaning of equipment in a hospital, the above would apply to general cleaning as well.